How Do I Manage My Freelance Business With Chronic Illness? You wake up, and it hits you. One that’s filled with headaches, fatigue, joint pain, brain fog and a whole host of other symptoms associated with your illness. Maybe you have a chronic illness or maybe you just woke up with a tummy bug. If you are chronically ill, freelancing is the perfect job. Either way, you feel terrible and you have no idea how you’re going to manage your writing business. As freelancers, we don’t have built-in “sick days,” but freelancing certainly has its perks in this area. 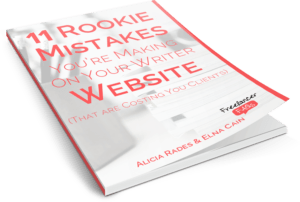 I started my writing business in 2016 after taking Elna Cain’s Write Your Way to $1k course. By early 2017, I’d built it to $3k/month, but then I was diagnosed with Chronic Lyme (a tick-borne disease) in June. The way I managed clients, the time I spent marketing, my writing schedule – it all had to be reworked. It can be hard being sick so often, and more than once you may feel like giving up. Hang in there because this gig you’ve got going on is just the thing to get you through those hard times. You can work from your bed: Invest in a laptop if you’re able. And did you know they make folding desks you can use in bed or on the couch? Yep, awesome. You can stay in your PJs: Getting dressed for the day is a good productivity tip, but you can totally just stay in your pajamas if you want. You can set your own deadlines: Space out your client projects to accommodate for downtime. I give myself 2 weeks per project but almost always deliver before then. It’s just nice to leave some wiggle room for flare-ups. So you see? Freelancing is the ideal job if you have a chronic illness – or even if you have a special needs child or are a caregiver of some sort. Now that you’re encouraged to continue your business venture, here are some tips to help you thrive. This tip is more about staying motivated than management, but motivation plays a huge role in business success, so it’s worth mentioning. Do you know how many freelancers run successful businesses while having a chronic illness? A ton! Connecting with those people can give you the encouragement you need (plus ongoing, targeted advice and tips) to power through those tough days. Being sick often means you don’t have time to market yourself like you should because all your free time is spent on client work. One way to grow your writing income during times like this is to increase your rates. I’ve been working with one client for over a year now, writing 2 blog posts a month. Our relationship has been picture perfect, but the rate we started at was now too low. I recently proposed a 100% rate increase, and they gladly accepted. They didn’t even try to negotiate! Try sending a polite email, emphasizing the length of your relationship, quality of work, timeliness of delivery and more. If you feel comfortable, briefly mention the growing costs of running your business, then propose a 25-50% increase. You don’t have to be a health writer to write for health-related companies. As someone with a chronic illness, you have built-in experience that plenty of companies would love to tap into. Businesses like these like to interview or accept paid guest posts from people working through their illness and pursuing entrepreneurial success. Who knows – If they like your work, they may hire you for their blog! Shoot for the moon, ya know? You never know when a flare-up will happen or a couch day will strike, but you can set longer deadlines in order to compensate for them. Two weeks is a good rule of thumb to follow. That way, even if you’re out an entire week, you still have another one to finish the project. If you have a client with weekly work (like with blogging), ask if you can deliver 2 posts every 2 weeks. It just gives you room to rest when you need to and hustle when you can. Freelance writing involves lots of sitting and staring at a computer. Prolonged sitting can result in stiff joints, back pain and more, which you don’t want to add to your already large list of symptoms. Once an hour, take a quick 5-minute break. Walk around, grab a snack, wash your face, etc. Just be sure to do something that involves a little activity. As an added bonus, movement sparks your thinking process. It wakes up your brain, allowing you write better, faster. It’s important to listen to your body. I know, I know – so cliché. But seriously. Don’t overdo it. Whether you have a chronic illness or you’re dealing with the flu, you need rest when you’re sick. Some days are just better spent on the couch. When that happens, you can do other things to manage your business besides writing tasks. While laying down, hop on your phone and do some social media marketing, promote your page on Facebook, comment on blogs where your ideal client hangs out and other simple tasks. On days when you’re stuck in bed, use that time to write insightful comments on the top 5-10 blogs in your niche that your ideal client reads. You’d be surprised how little work can go a long way! Do you have a chronic illness? How do you manage your writing business? Let me know in the comments! How Do I Attract My Ideal Freelance Writing Client? Jordan Mitchell is an ecommerce copywriter & blogger for (mostly) health & wellness brands. After being diagnosed with Chronic Lyme and seeing improvement by eliminating toxins, she launched her blog Detox & Prosper to help families learn how to live well with less toxins. Follow her on Pinterest for practical ways to live healthy and thrive! Hi, Jordan. Thanks for your encouraging words. I’m a caregiver to elderly parents who have chronic health issues. I’ve wanted to approach health and wellness sites but don’t have a background as a health writer. Your post has given me the push I needed to just go for it. Very best wishes. Jordan, you could not have done a better job with this blog post! I have chronic kidney issues and chronic urinary tract infections that keep me sick around the clock. A corporate job ismt a good match for me because of my health issues. Because of that, I started freelance writing. I haven’t looked back since then. Thanks so much Lizzie! Isn’t it so great to be able to work from home on our own schedules?! Grateful! This is such a great article and topic. It must be so hard to be incapacitated on a regular basis and not know whether today will be a good or a bad day. I feel for you. I don’t suffer any chronic illness but I do go through very bad PMS every month which causes my energy levels to drop drastically and leaves feeling very bleh for 1-2 weeks. It does affect my productivity. If I have work to on days I don’t feel great, I just push through and finish it or if I have leeway on the deadline, I tackle it another day when my energy is up. If I don’t have work, I can just take it easy. That’s the great thing about freelancing. If I’m feeling crappy or come down with a cold, I can choose to rest. That’s something you can’t do in a 9-5 job! Yes, Deevra! The freedom that freelance writing offers is one of my favorite “perks”! This is such a helpful article for bloggers who have chronic illnesses. I agree it is the perfect job – you can factor in your work around how your body feels per day. I found batching to be a great way to avoid having to catch up when you are too ill to work. Another tip to use is voice typing especially if you have inflamation of the joints. Most important of all is to respect the limitations of your body so you don’t have a major health setback that affects your work. Looove batching tasks for my wellness blog. And that note about respecting your limitations is so true. I’m actually going through some pretty intense treatment right now for Lyme disease, and I decided it was best to not do any client work for the whole month. I absolutely love the freedom of freelancing – and my clients who are so gracious! I was actually thinking about writing on a similar topic on my WAHM blog. I have IBS and was thinking just yesterday during a flare-up that it would be really hard for me to keep a regular job not knowing when I’d be hit by a flare-up. Working from home as a freelancer really does provide people like me with the best way to pay the bills without constantly being worried about taking too many sick days. Love the tip about setting longer deadlines. I used to have a 72-hour turnaround and changed it to a 5 business day turnaround. I’m going to make this even longer for bigger projects because I hate feeling rushed an the stress from that can actually trigger an IBS episode. That’s a hard thing to realize – that stress can actually trigger a flare up – but once you do, you can make changes to reduce stress. That’s what is so great about freelancing – It’s YOUR biz. You make the rules! This really gave me the motivation I needed to continue to push through. I have Spinal Muscular Atrophy (SMA) and I tend to get respiratory issues every now and again that can keep me down for weeks. Right now, I’ve been fighting pneumonia for a little over a week. There are days when I feel somewhat ok, and there are days where I just feel terrible. I had been thinking about putting my freelance career on hold at least for now but this just really inspired me to keep going with it. Thanks for the article! I’m so glad this encouraged you, Vanessa! There’s no harm or shame at all in scaling back a bit, but I would definitely keep pursuing your freelance career. Besides the fact that it pays the bills, I love that it helps keep my mind sharp and even take my mind off the physical pain. Listen to your body and adjust your schedule as needed, but by all means, don’t give up. You got this!